Hutcheson’s Dublin: Who was Francis Hutcheson? Francis Hutcheson has been called “the Father of the Scottish Enlightenment”. He influenced Adam Smith (a pupil of his) and David Hume. He is credited with being the first to denounce slavery from a human rights perspective. His thought has been linked to the American Founding Fathers and to the United Irishmen. But who was he? Francis Hutcheson was born on the 8th of August 1694, probably in Saintfield, Co. Down, in his grandfather’s manse. Both his father and grandfather (who originally came from Scotland) were Presbyterian ministers. As a Dissenter (a protestant who was not a member of the Church of Ireland), Francis Hutcheson could not attend Trinity College Dublin. Instead he attended a dissenting academy in Killyleagh, which provided a basic third level education. From there he went to Glasgow in 1710, taking a course of study aimed at fitting him to become a minister. He left the university in 1717, received a licence to become a minister in 1718 and got offered a post in Co. Armagh. But he didn’t take it. Instead he took a post offered in Dublin by the Wood St meeting house to open a dissenting academy there. The law had only just been changed, the position would be precarious, but in the end his Dublin years proved Hutcheson’s most fruitful. It was there that he first developed his moral and aesthetic theories, published in two books and a series of letters. He was part of the Molesworth Circle. He was there when the Unitarian Church in Ireland was just starting to form, when Swift wrote the Drapier Letters and Berkeley was lecturing in Trinity College. He left in 1730 to take up a post in the University of Glasgow. He died on a visit to Dublin on 8th August, 1746. The Dublin he knew was different to the one we see today, but just as his thought influenced the modern world view, traces of that early Augustan Dublin still remain. 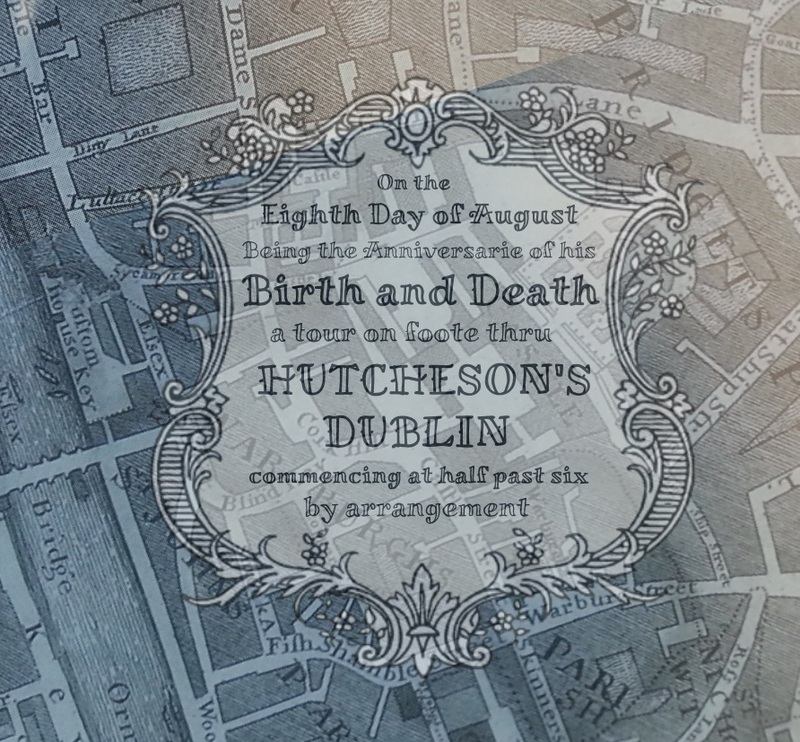 There will be a tour of Hutcheson’s Dublin, talking about the people he met, the streetscape he would have seen and the philosophy he wrote there, on 8th August 2014 at 6:30pm. Numbers are limited, to sign up please contact me on Twitter @cathyby or via the contact page.